Durango Barn . 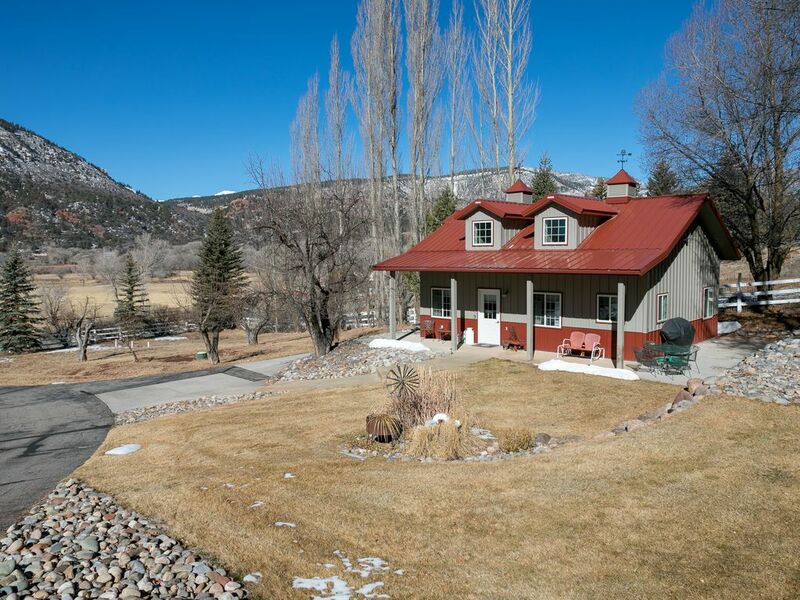 . . private and cozy in the coveted, Animas River Valley. This exclusive property is located in the pristine Animas River Valley on private acreage only 5 minutes from downtown Durango and is teaming with wildlife such as deer, elk and beautiful birdlife. The majestic cliffs start on the property and rise with incredible beauty to the east. To the west, enjoy views of Elk in the Animas River Valley and the great Animas Mountain in the background. The road adjoining the property is very quiet and there is a covered tennis court for your enjoyment. This new modern beautiful home is very close to Downtown Durango, yet very rural and private. The incredible Bread bakery is 3 minutes from the home with great coffee, baked goods and fresh sandwiches.This home is built strong like a barn with all the amenities of a home inside. Incredible views of the red cliffs to the east and Animas Mountain and the Animas River Valley to the west. Out your door is one of the best county roads to run, walk or road bike great distances. Lovely cottage tucked up against the mountains! Charming 2 bedroom property. Just a few mins from Durango. Deer greeted us each day and the view was beautiful! Thanks for the very nice review Sandra! I appreciate you staying with us and hope you'll come and see us again sometime, soon! We very much enjoyed our stay at the Durango Barn and we would certainly stay there again. It was perfect for me and my wife. The location is very convenient to Durango, and to our surprise, we had deer on the front lawn almost every evening. The owner is very helpful and friendly. She even called me to suggest hiking locations. Most of all, the place is clean, clean, clean and the pride of ownership clearly evident. Thanks Steve for the very nice review on the Barn! I was happy to hear you enjoyed your stay and look forward to welcoming you back to the Barn or one of our other homes along County Road 250 in the not too distant future! We visited while in Durango for Skiing at Purgatory and enjoyed the location (RT250 about halfway between town and Trimble Rd. Note at Trimble Rd/RT550 there is a great small gourmet market, PJ's that is worth the stop) a very quiet location in the Animas river valley. This is a country road so pretty quiet with many horse properties along the route, as well as deer and elk at the right time of year. We had our dogs with us, and there was a bit of yard behind the gate for convenient outside time as well as walks along the road. The cabin is modern, very very clean, and the property manager easy to work with and responsive. All the pictures accurate, and the facing of the property gets lots of light with some views across the valley. We like this location because of the quiet and ease of getting to Purgatory for skiing and into town for dinner (Animas Brewing is more of a local place, with good food and a nice variety of non-IPA beers). If you want a dog-friendly patio, Ska brewing usually allows dogs on the patio, and has a pretty friendly afternoon crowd. Thanks for the wonderful review on the Barn Justin! I was happy to hear you enjoyed your stay. I look forward to welcoming you back in the not too distant future!